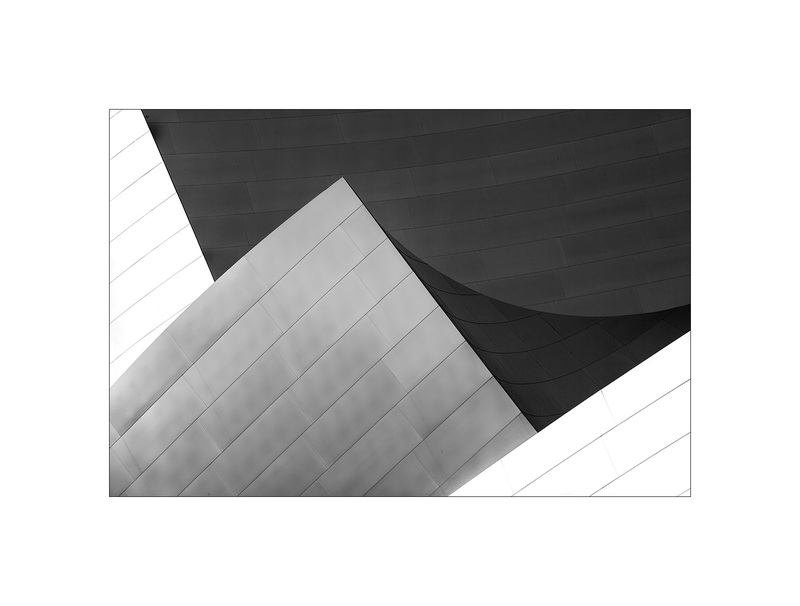 Continuing on from my last post, here are a few more from the 2010 archives of my shoot at the Disney Concert Hall in L.A.. Once I got started looking at these old files, I could not stop. I mean, how did I miss processing the lead color image? I love this shot! Nice! I think it would be fun doing side by sides of the B&W Dunes with the bottom two images! Funny you should say that, I have always thought about Gehry buildings as nothing more than sand dunes. All three are winners, but I agree about the first one. Maybe you missed it the first time because you had something else in mind that blocked your ability to see this one. Glad you went back! Oh I don’t think that, I know that is true! 🙂 I know exactly why. Because back then, I felt adding the tree was distracting. I felt it important to be clean and minimal with these type of images. With photographic maturity, I now see the tree in very different light. I believe it adds to the image! Thanks for stopping by Linda and for your insightful comment. You’ve got me thinking…. you said, “blocked your ability to see this one”…. it is interesting that I did “see” it when I took it. The fact that I spent time carefully framing it suggests I did see it, yes? So, the block seemed to come when reviewing the images… it is then that I must be imposing my desires for what I was hoping for from that shoot. Thanks for stimulating the thoughts! Visions beyond sight… Awesome images JB! 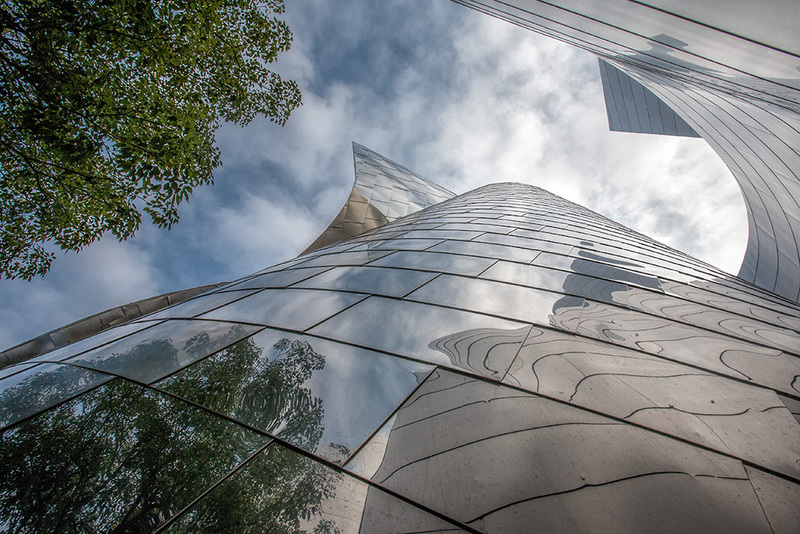 I believe you’ve captured what Gehry visualized his buildings to be… Yet modern, his buildings harmonize with their surroundings… from the sky, clouds passing by, weather, trees there on location or those purposely planted after construction, etc. 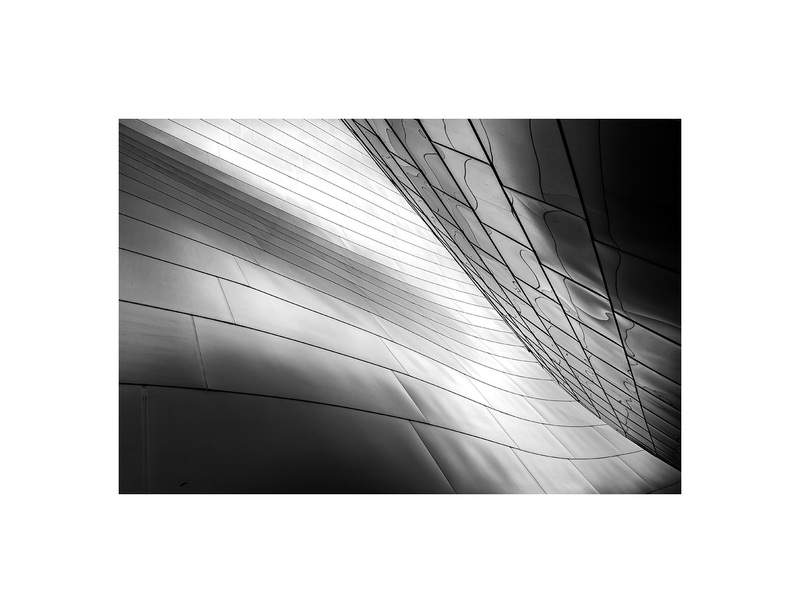 … To all the elements and concepts… Gehry’s vision to build a building with purpose within, out and all considered… his artistic genius and visions are beyond the architect. As in any landscape, you can focus on a subject, a mountain, surrounding trees, water elements, sky, clouds or whatever you are presented… As a photographer and artist: What you see, place within your viewer and ultimately capture within pixels is your vision, expression, exposure and creation of what you see and feel. From harmonizing clouds, blue sky and reflections within and out… To a pyramid or dunes… You’ve geniously captured three awesome images from one site and structure! Far beyond snapping a picture of a building! I am sure you have more hidden gems and there will continue to be endless possibilities awaiting for your next visit, adventure, awareness and experiences! You’ve proven that images are worth the time to savor, revisit and enjoy rather than focus on your next captures. Sometimes your visions are beyond sight and take a second look or two – or coming back to years later – to enjoy what you saw and experienced “at the moment” and from your experience. Great post and images JB! So being sick had its advantages, JB! Or maybe the fact that you had to dig back in the files for something…either way, we’re glad you did! I love all three of these photographs. Well done. Wow….these are fantastic. But the one that really knocked my socks off is that first black and white. Pure wonderful abstractness!!!!! Yeah, I kind of like that one too! Thanks Howard. I think now that I actually remember that original posting…was it that long ago? I think I had just been there and was amazed at what you had captured. And now, there are more?! Nice find! Yup it’s been that long!